As we all know, Pantone named Tangerine Tango the Color of the Year for 2012. I received a great press release that I wanted to share from one of our quartz manufacturers of an article on how to use Tangerine Tango in the kitchen and bath. Kim Lewis, the former production designer for ABC’s “Extreme Makeover: Home Edition” offers some really great tips. New York, NY (January, 2012) The start of 2012 has heralded a renewal of optimism, and no where is that more evident than with the explosion of bright, bold orange hues. From fashion to home design, the rich, warm shade is spicing things up. 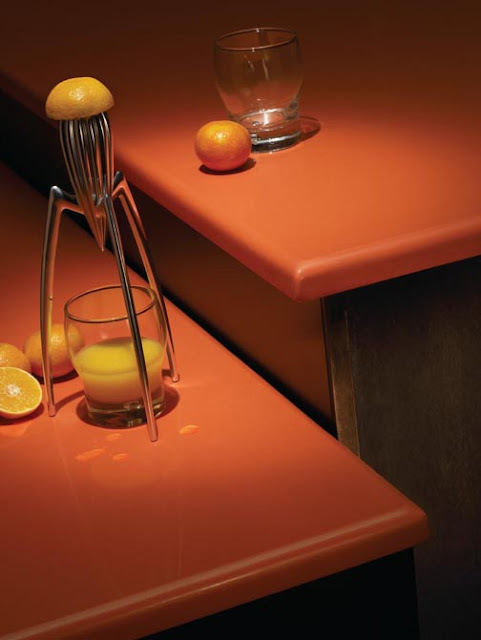 For the home, color innovator, Pantone has designated it's color of the year as "Tangerine Tango," while leading quartz manufacturer Silestone, offers similar tones in its expansive line of surfacing with the luminous "Orange Cool" and radiant "Rosso Monza." “Color is key in design," said Kim Lewis, the former production designer for ABC's "Extreme Makeover: Home Edition." "Set your mind free --using unexpected color in your own space can be liberating." 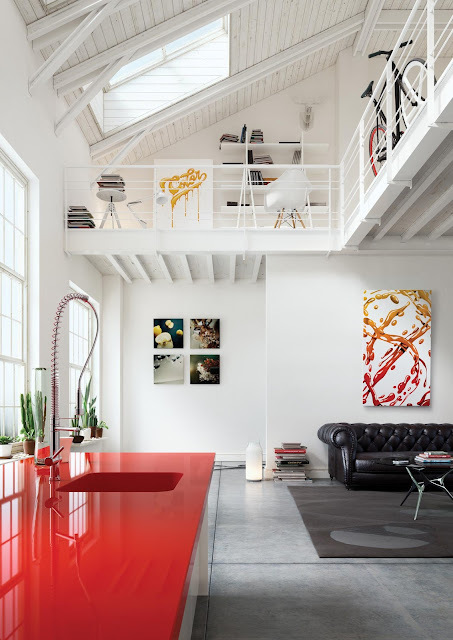 Whether homeowners want to ease into colorful design using bold accents, or completely dive in, Lewis, has tips for adding zest in the kitchen and bath--two rooms that can add significant value to a home. “The two spaces in our home where we need to find the most energy are the kitchen and bathoom," said Lewis, who recently founded Kim Lewis Designs. 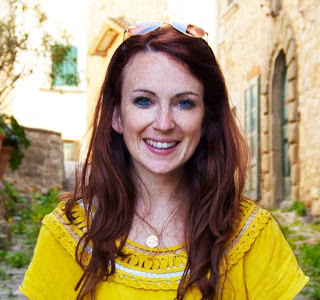 "After all, this is where we spend many hours pulling ourselves together for the day ahead. With a splash of this citrus color, known to have an energizing effect, you might not even need that second cup of coffee in the morning. Let color awaken your soul and inspire your day." To invigorate the kitchen and bath, Lewis offered some fresh ideas for homeowners wanting to test out this year's hottest color and for those who want to fully transform their space. Get the look: "Bring a Country Fresh style to your kitchen or bath by combining orange accessories with White Zeus Extreme Silestone countertops and white or light---finish cabinetry. 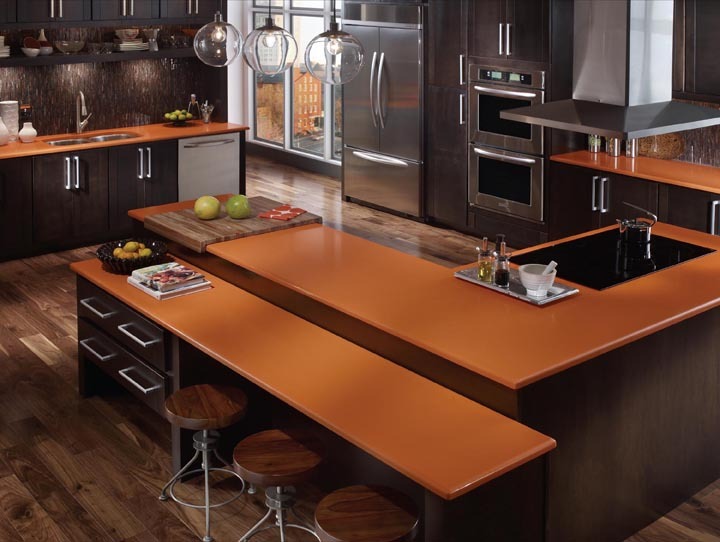 Bring the Silestone into the backsplash to allow the orange accents to really pop." 2. Brush it on: "Find the focal wall in your kitchen or bath, and coat it with bold orange paint. When using a daring paint color, I suggest all other finishes in the space be white or gray, creating a contemporary or eclectic style." Get the look: "Combine your orange walls with the Silestone's "Grey Expo" in the Volcano texture along with white cabinetry, white plumbing fixtures (with satin nickel or chrome faucets), and white tile in the bathroom or light bamboo or cork flooring in the kitchen. For a softer look in the bathroom, use Silestone's "Lyra" on the counters." 3. Immerse your space: "Let's be honest--you want your kitchen or bath to be the talk of the neighborhood and using an orange countertop will empower the design of your home. Silestone offers a color called "Orange Cool" that pairs nicely with white, gray and silver." Get the look: "Use "Orange Cool" as the kitchen island and balance the surrounding countertops with "White Zeus Extreme" or the steely gray "Kensho." Go even bolder and feature Silestone as a backsplash or wall treatment in your kitchen or bath. When featured on an entire wall--it becomes the focal point of the space. For the look, use sleek, neutral cabinetry, preferably white that compliments the dynamic color. Select Silestone's "Chrome" or "Steel" from the Platinum Series for the countertops. I have yet to find another countertop that's even remotely comparable to this series." Use the material to create a bookcase in your living space. Apply Silestone to the top of bench seats on either side of your fireplace for extra seating. Cover your fireplace surround (floor to ceiling) with Silestone, to create a sleek accent wall in the room. Create a custom dining table, by using Silestone as the tabletop. Wrap your tub or kitchen island in Silestone--it's the perfect material--so easy to clean, with no grout to worry about. I recently used Grey Expo in the Volcano texture as the top for a shower bench in Jewel & Ty Murray's master bathroom. For more information about Silestone visit their website. Also, be sure to check out Kim Lewis Designs to see more of Kim's beautiful work.